Studiocanal have announced anniversary Blu-ray editions of two acclaimed works of 20th century French cinema, the 1952 Casque D'Or and the 1972 César et Rosalie. Set in Paris at the turn of the 19th Century, Casque D'Or follows the love affair between gangster's moll, Marie (Simone Signoret – Room At The Top, Les Diaboliques) and reformed criminal Georges Manda (Serge Reggiani – Les Miserables, The Pianist). When mob boss, Felix Leca (Claude Dauphin), takes an active interest in their affair, an underworld rivalry ensues leading to a treacherous and tragic end. Directed by Jacques Becker, who also gave us the crime classic Touchez Pas au Grisbi (a favourite film of the French Novelle Vague filmmakers), Casque D'Or is a classic, poetic tale of doomed romance based on the true-life Leca-Manda scandal. Evoking the Belle Epoque period perfectly and with an unforgettable femme fatale performance from Signoret, Casque D'Or is considered a Becker masterpiece. At the Heart of Emotions – the Legend of Golden Marie. Rosalie is a beautiful vivacious young woman involved with a charming, successful businessman called César. He is crazy about her and his exuberant vitality satisfies Rosalie's terrific lust for life. One day out of the blue Rosalie's old flame David appears, desperate to win back her affections. César's intense jealousy shocks Roaslie and she ends up running into the arms of David and the pair are separated. Rosalie however begins to doubt that she's made the right choice, until fate ends up deciding for her. 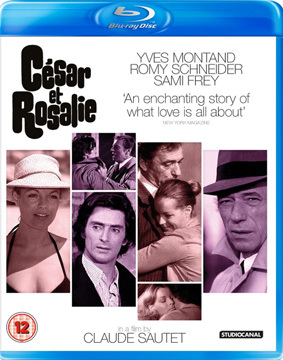 César et Rosalie is an enchanting French romance starring Yves Montand (Jean De Florette) and Romy Schneider (What's New Pussycat? Sissi), directed by Claude Sautet (Un Coeur en Hiver, Les Chose de la Vie). 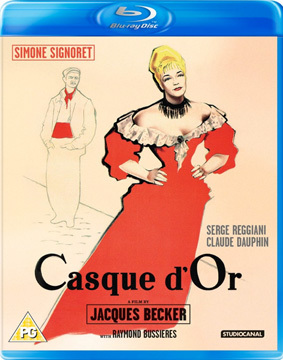 Casque D'Or and César et Rosalie will be released indivisually on UK Blu-ray on 5th November 2012 by Studiocanal at the RRP of £22.99.